As mentioned in a previous post, our Honda CR-V, the first car I have ever owned from ‘new’, started to show some signs of its age this summer. First, the A/C compressor blew out on our roadtrip this summer, then we realized we would need new front brakes before the summer, and there was also the increasing number of creaks and squeaks that seemed to appear every time we drove it. None of this was a surprise with an 8-year old car so we made the decision rather quickly to try and sell it off before dumping a bunch more money into it. We were lucky enough to sell it on our work bulletin board to an eager buyer and it was gone within days. The CR-V in happier times. Outer Banks, NC. We often have discussed our need for more space, particularly when people are visiting or we are on a long road trip, so the minivan became our point of focus. We settled in on the Honda Odyssey as it seemed to check all the boxes for us. While a quick and easy sale was great, it also left us without a car and we needed to move quickly. I had heard of Unhaggle previously, and since we had a pretty good idea of what we wanted, I put our specifications in. Esentially what Unhaggle offers is the car costing sheet – what the dealer pays for the car – for free. In addition, for a fee of $99, Unhaggle will solicit offers from car dealers in your area with the idea being that they will compete against each other for your business and you end up with the lowest price. I was going to pursue this but reading through a few message boards online, people seemed to think you could get a better price most of the time by negotiating yourself rather than putting it through Unhaggle if you were willing to put in a little bit of time. One thing that has really changed since we bought our last car is that car dealerships will actually respond to, and bargain over, e-mail. Almost every dealership I e-mailed in our two days when I knew we needed a new car was good about coming back with a solid offer and also willing to beat other offers that I got over e-mail. This ended up being almost as efficient as using a service like Unhaggle. We basically figured out the price floor pretty quickly for our vehicle and I checked online via RedFlagDeals and a couple of other forums to ensure we knew what the best prices others were getting. With that, it only took us about an hour and a half in the dealership to review the features of the Odyssey, go back and forth once on price, and then decline all the extra warranties, rustproofing, and whatever else they try to add on. All in all, a very smooth sale and we knew we were getting what we wanted at a very good price. Two weeks in, and we are both pretty happy with our purchase. The space in this car is endless, it will be great to be able to take extra passengers and we are eager to plan out some exciting family roadtrips over the next few years. When I was a kid, the thing I felt I was really missing out on was having a trampoline in our backyard. Every once in a while, we would visit someone who had one and I would never want to get off. Not understanding the severity of spinal injuries, I couldn’t understand why everyone wouldn’t have one of these. Fast forward 25 years and not only have trampolines become a lot safer (at least this one) but I also finally have one in my backyard. For about the past year we have been discussing getting a trampoline and in April we finally went ahead and got one. 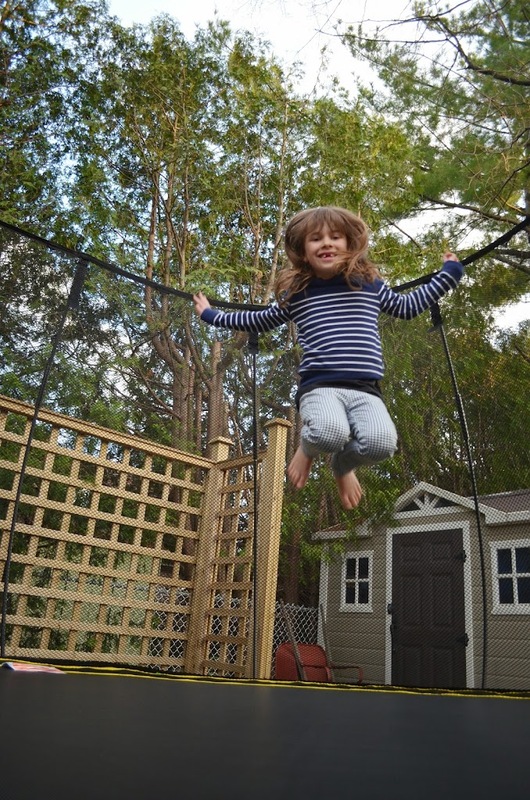 There was never a doubt that we would be buying a Springfree model, given their much safer design where the kids are not exposed to the springs and the net is of a more forgiving nature than some of the other models. However, we wavered on what size to get and watched for them to go on sale. Overall, this was a great purchase for our family. The kids love getting outside to spend time in the backyard on it and I think they will get a lot of use out of it. The setup of the trampoline is definitely some effort (despite what the videos on the website say) and took us a little over three hours. I would not look at any other models than the Springfree. The setup and the additional cost are both much easier than dealing with one broken arm on a more traditional model. Since we decided last year that we were going to buy a trampoline this spring, we have been watching the prices and have realized that there is very little fluctuation. Springfree controls this to a certain degree by their distribution. In Canada, I believe they only sell through Toys R’ Us, Canadian Tire, Sears and Lowes. In addition to that, they seem to give each store access to a slightly different selection of the trampoline models. For example, our model is only sold through Toys R’ Us and the Large Square (11’x11′) model is only sold through Canadian Tire. When I was searching, I tried to find information on the best prices for each of the models and didn’t have much luck. Based on my experience, the best promotion for the large oval is when it goes on sale for $150 off. It seems that the large square (11’x11′) only ever goes $100 off at Canadian Tire while the Jumbo (13’x13′) goes on sale for up to $200 off at Sears and Toys R’ Us. Interestingly, Springfree trampolines are much more expensive in the United States than in Canada. A nice change!